Alice Kuhl, a mother of 3 who lives in her RV in Santa Cruz, asked SCPD Chief of police Andy Mills some hard questions last week. Kuhl challenged what she termed harassment by hostile homeowners and SCPD’s vehicle abatement enforcer Joe Haebe. She noted lack of support from Mills SCPD complaints line and sought assurance from Mills. She got none. Some weeks ago, Kuhl came to a HUFF meeting with a flyer. One side of it was a hostile and inaccurate flyer urging her to move her vehicle. The other was her response. After meeting with HUFF and Conscience and Action, she agreed to speak publicly with Chief Mills–this happened on Thursday January 10th. “Clarifying RV Dwellers’ Rights in Santa Cruz ” at https://www.indybay.org/newsitems/2019/01/07/18820149.php . Most of the meeting was videoed by Salinas Union of the Homeless activist Wes White and is posted at https://www.youtube.com/watch?v=jOMxmjPs40Y&feature=youtu.be . Several RV dwellers and numerous reporters videoing covered the exchange in front of the SCPD police station. Particularly at issue for Alicia Kuhl and other houseless folks was harassment actions by enforcement officers like Joe Haebe ignoring their right to park on public streets for 72 hours unmolested. She asked Mills to instruct his officers to respect that 72-hour window, which, she and other vandwellers said, they took care to not overstay. Mills insisted he had a responsibility to investigate all complaints and praised Haebe’s work in “tagging and towing”. Mills did not respond to requests that he instruct officers not to “take the side” of the homeowner, and to view repeated “get this vehicle out of my neighborhood” style calls, skeptically. The general brunt of the questioning was a futile effort to persuade Mills to direct his officers to respect the 72-hour law. Not to seek out minor violations (like cracked windshield, bald tire) as a “spur” to getting vehicles to immediately move to placate housed vigilantes nearby short of the 72-hour period allowed. Mills needs to require officers to limit themselves to determining if a vehicle has overstayed 72-hours (which he said police can do through an undisclosed system). Kuhl claimed earlier that she was obstructed in her attempt to determine the identity of those complaining about her vehicle and the specifics of their complaints. She also suggested that her vehicle was being targeted. She questioned Haebe’s enthusiasm in threatening vehicles with ticketing and suggested earlier it seemed to indicate an anti-homeless bias. 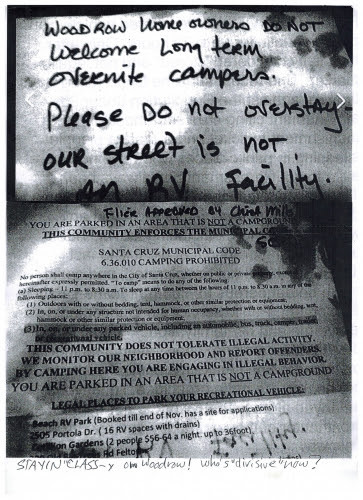 Vandweller Veronica Crow noted the appearance all over town of “permit parking only” signs that ban parking at night without a permit–a specifically anti-homeless provision. Is Mills explicitly advising callers complaining that vehicles have a right to be there for 72 hours? Are his cops notifying them that filing a false police report is a misdemeanor? Is he looking into the claims that his “go to” guy Haebe is engaging in “hunting expeditions”? Mills sympathized that those in vehicles are only going to face street homelessness if his cops vigorously persecute vehicles at the instigation of neighbors. However he explicitly refused to offer a change in any policies, some of which are discretionary. He may agree that police have higher priorities that removing them because of the aesthetic preferences or unfounded fears of residents. But if he refuses to act to rein in those abuses, the buck stops with him. Other issues raised were the crying need for a carpark. Mills sympathized but declined to offer any public advocacy. He also suggested folks leave town and go to campgrounds (costly) and ask churches and businesses for parking space (largely unsuccessful in the past). Numerous reporters were at the conference taking notes, audioing, and videoing. Jessica York of the Sentinel was there for some time but the Sentinel wrote nothing. She told Kuhl she’d contact her for follow-up…but never did. I did comment at length as I played the full audio of the encounter on my Sunday radio show at http://huffsantacruz.org/lost/1%20FRSC%201-13-19.mp3 (25 minutes into the audio). Last Sunday Mills wrote an editorial for the Sentinel, apologizing for other abusive police departments, but ignoring concerns about his own. He also announced joint sponsorship of a Martin Luther King day march with the NAACP on Monday the 21st. While Mills has commendably backed down somewhat in issuing citations for survival sleeping, rangers under his direction do seem to have increased citations for “being in a closed area’, a fancy name for “trespass on public property” in parks at night. He has also declined to answer numerous outstanding questions about his department’s use of tasers, baton strikes, guns, etc. Mills has said he holds meetings on Monday mornings. Contact the SCPD at 831-420-5810 to make an appointment. If you think it’s worth the time and breath. HUFF and Conscience and Action members met today to discuss further steps in documenting and challenging abuses targeting those whose homes are in vehicles. Volunteers interested in assisting this project, call HUFF at 423-4833. This entry was posted in HOT ISSUES and tagged Homeless, Police repression, Vehicle Dwelling by huffsantacruz. Bookmark the permalink.